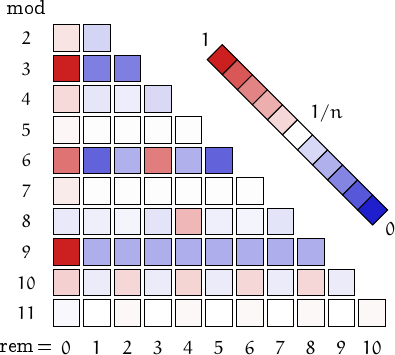 A number is pandigital in base if its base representation contains all the possible digits, i.e., 0, 1, ..., b-1, at least once. If contain each digit exactly once, it is called strictly pandigital. For example, 1023456789 is the smallest (strictly) pandigital number in base 10, while is pandigital in base 4 but not strictly pandigital. Many authors use simply the term pandigital to mean both kind of numbers, so I will do the same, since usually the right meaning will be clear from the contest. 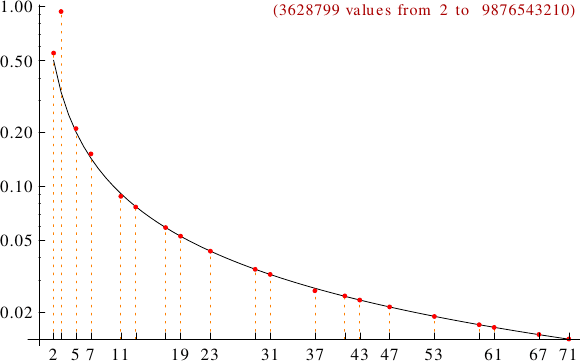 A graph displaying how many pandigitals are multiples of the primes p from 2 to 71. In black the ideal line 1/p.